Traditional Taekwondo patterns (called forms or poomse) are similar to the Karate kata forms, a exercise practiced in various martial arts. Poomse is the Korean word for form or pattern. The forms you’ll be practicing depend on what organization your Taekwondo dojang belongs to. Taeguk forms are practiced by WTF schools; an ITF form practices the 24 forms developed by General Choi; ATA schools practice forms designed by ATA’s Master Instructor and his colleagues in the 1970s. 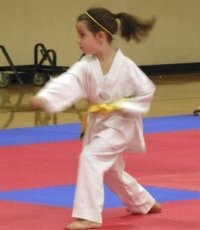 Taekwondo-Guide.com believes that you should learn these forms from a trained, certified Taekwondo instructor, not from a web site or a book. Focus on the form. Generally, you come to attention, go into a chumbie (ready) stance, wait for the command, and then perform the form. At the point where you begin the form, clear your mind of everything else and focus only on the form. Put your brain where your body is. When learning a form, watch the instructors and senior belts practice. When you work on it, mentally block out the rest of the students in the class, in order to avoid being influenced by another student who may be doing it wrong. Put energy into your form. Just going through the motions creates sloppy habits and isn’t a good workout. Doing the moves with the proper power and speed is a great workout as well as well as good training. Details matter. While a white belt may still be struggling to get all the punches at the right height, a red belt should be much more skilled at the details. At higher levels, consistent technique, sharp blocks, powerful strikes, etc., are part of the expectations. Taekwondo patterns are also part of competitions - learn more here.